I met Alex during a concert of Stamatis Spanoudakis in Athens several years ago. Since then, I have hardly missed any of his performances as first violinist and solo performer. He first started playing the violin when I was 8 years old. Besides classical music and that of Stamatis Spanoudakis, he composes his own music in different styles from ethnic, rock, jazz and new age. He has 2 violins a Johannes Baptista Zanolli dating from 1780 and an electric violin made by Andy Hollyman in the UK. Here are some photos of him in concert and rehearsals. 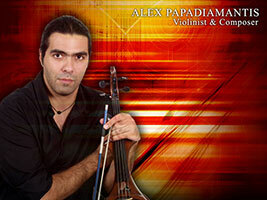 For more his website is http://www.alexpapadiamantis.com.